No patient wants to wait 6-8 months to replace a missing tooth. We live in a society built around immediate gratification. With all the advantages of today dental implant technology, we can predictably cut that waiting time down by three months or as short as immediately getting a tooth when we are able to combine immediate placement with immediately loaded dental implants. Traditionally, endosseous implants are loaded once bone healing at the bone–implant interface has occurred. The complete healing phase may take up to 12 months following extraction. However, this post-extraction period may be accompanied by several problems such as alveolar bone resorption as well as psychological distress to the patient. The key to being able to provide either one of these treatment options is having the ability to achieve outstanding primary stability of the implant upon placement. This one single aspect of the treatment can make or break a case . Many of the implants out on the market cannot achieve adequate primary stability due to their implant body macro structure. Only an implant designed specifically for immediate loading will predictably provide the mechanical stability necessary for success. Lets look at a few of the factors that can affect stability. The first two that we will look at are the micro and macro structures of an implant. Micro structure is the microscopic surface topography of an implant. In simple terms, is it smooth or is it rough. The rougher the surface, the better. A roughened surface is directly associated with higher implant survival rates (Figure 1) . Micro structure has a direct effect on the osseointegrative process and therefore most important in the long term stability of an implant after healing. Titanium implants with micro-rough surfaces achieve a faster bone integration, a higher percentage of one implant contact (BIC), and a higher resistance to shear documented with higher removal torque values (RTV) when compared with titanium implants with a polished or machined surface . Nanotechnology has received wide attention in public and scientific media and its scale ranges from 1 to 100 nm. While the microtopography of the implant surface has been proposed to act at the cellular level of osseointegration , nanotopography of dental implants is thought to influence cell-implant interactions at the cellular and protein level. The surface of an implant can be roughened in many ways. The most common ways to create a porous titanium surface is to utilize, blasting the surface with resorbable blast media (RBM), blast with aluminum oxide, acid etch, a combination of etching and blasting (SLA) or a host of other methods. Figure 1: Survival rates of smooth vs. roughened implant surfaces. The macro-roughness of the SLA (Sandblasted, Large grit, Acid-etched) (Straumann Holding AG, Basel, Switzerland) surface is manufactured by large grit sandblasting with 0.25–0.5 mm corundum particles at 5 bar (25). The micro-topographic surface structure is the result of a subsequent acid-etching process with HCl/H2SO4 at high temperatures  generating an active surface area with equal roughness and enhanced cell adhesion . The OCO Biomedical surface is based on a comparable approach, but utilizes Nitric acid rather than the HCl/H2SO4 . The macro structure of a dental implant refers to the gross shape of the implant. This includes taper, inclusion or exclusion of a divergent collar, thread pitch and type and the apical tip of the implant. Tapered implants were initially designed mainly to serve for IL after tooth extraction. The theory behind the use of tapered implants is to provide for a degree of compression of the cortical bone in a poor bone implant site . In clinical situations where immediate placement is decided upon, the macro structure becomes very important (Figure 2). In fact, it becomes the most important aspect of the implant to provide the mechanical stability necessary to prevent excessive micro-motion during the healing process. In order for osseointegration to occur, the implant must be stable enough to resist any sliding motion greater than 150 μ. Movements greater than this will result in encapsulation of the implant with soft tissue and eventual failure. 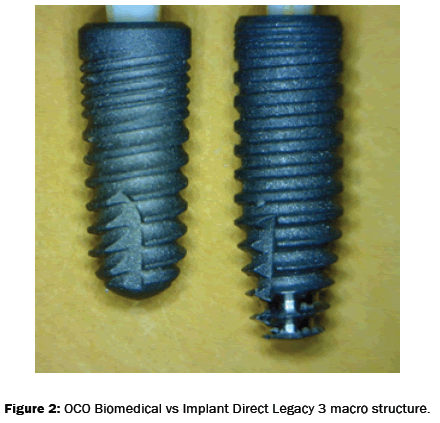 Figure 2: OCO Biomedical vs Implant Direct Legacy 3 macro structure. Other ways to increase the primary stability of an implant is to drastically increase the surface area available to resist forces during healing and provide stress distribution once integrated. This can be accomplished either by increasing the diameter or increasing the length of the implant placed . These two parameters are directly related to each other. Bone type is also a factorshorter or narrower implants were affected more by poorer bone quality (D3-4) than when they are placed in better bone quality (D1-2) . Table 1: How length and width are related and their effect on surface area. Mijiritsky et al. investigated the long-term survival of single-tooth implants immediately placed in fresh extraction sites with a 6-year follow-up. 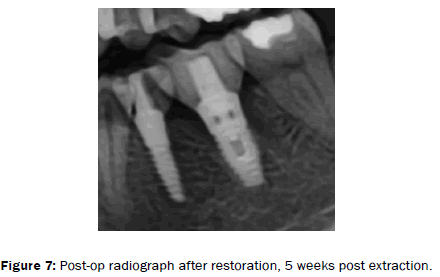 In this study, 24 implants were placed in fresh extraction sites in 16 patients. The results demonstrated an overall implant survival rate of 95.8%. The study concluded that successful osseointegration can be accomplished with IL implants in fresh extraction sites. The peri-implant conditions were also stable till the sixth year of follow-up . Likewise et al. evaluated the long-term survival of 111 immediate implants placed in 111 individuals with immediate provisionalization (out of occlusion) and monitored them over a period of 5 years. The parameters for overall success rate were deﬁned by bone resorption of less than 1.5 mm after the ﬁrst year of IL and less than 0.2 mm subsequently. The study reported a success rate of 92.5% for immediately loaded implants placed immediately after extraction compared to healed sites (success rate: 100%) . When evaluating the results of this study, one must take into consideration that the implants placed in his study were not ones likely not designed with a macro structure intended to enhance immediate load and were challenged with respect to attaining primary stability. When we are placing implants into an extraction site, there are more variables to contend with than are encountered when placing implants into previously healed sites. There can be trauma from the extraction process, the presence of infection, and the introduction of graft material into the peri-implant environment. Trauma to the hard and soft tissue must always be minimized. The fragile buccal wall is the area most susceptible to damage during an extraction. If this wall is damaged or completely destroyed, the overall procedure becomes a bit more complicated. In this instance it is recommended to not only graft, but to proceed with guided tissue regeneration and the use of a membrane to confine the graft and prevent soft tissue migration into the newly grafted area. The use of specialized instruments such as X-tomes (A. Titan) and sharp-beaked forceps can facilitate the most atraumatic extraction possible with the best potential clinical outcome (Figure 3). Once the tooth is removed and the implant placed, there is usually a gap between the implant and the facial wall of the socket. This “gap” must be managed. If it is over 2 mm, then graft material should be used to fill the space . If under 2 mm, the site will likely fill in predictably with bone on its own. Figure 3: Use of an X-tome to facilitate an atraumatic extraction. Infection of the tooth to be extracted does not necessarily prevent implant placement. If infection is present, it really depends on how it presents clinically. The presence of purulence is an absolute contraindication when it comes to immediate implant placement, but the presence of a localized peri-apical radiolucency (PAR) is simple to contend with (Figure 4). Most of the time when the tooth is removed, the peri-apical tissue comes out with the root. Even if it does not, the thorough debridement with a sharp curette should sufficiently clean the site. If the radiographic radiolucency is diffuse, it can be a bit more challenging (Figure 5). Lacking defined borders, it is difficult to ascertain the penetration of the bacteria into the surrounding bone or the true extent of the infection. In my experience, dealing with the former situation is predictable and the patient is usually prescribed a pre- and post-operative antibiotic. On the contrary, the second scenario can become a clinical issue if the implant becomes the foci for infection. In these types of cases, I prefer to extract the tooth and return after a week of antibiotic therapy. The site is then treated as a delayed immediate placement case (Figures 6 and 7). Figure 4: Confined peri-apical radiolucency. Figure 5: Diffuse radiolucency associate with an acute infection. Figure 6: Pre-op radiograph 3 weeks after extraction. Figure 7:Post-op radiograph after restoration, 5 weeks post extraction. Whenever placing graft material, whether it is allograft, alloplast or xenograft; the use of antibiotics is recommended. This author’s go-to antibiotic either for infections or with grafting is Amoxicillin 500 mg tid x 7 days. If the patient is PCN allergic, then Clindamycin 300 mg tid x 5 days is the alternative. If proper surgical techniques are applied, then the clinical outcomes of immediate loading can be superior to those for conventional delayed loading protocols . When immediately placing dental implants into extraction sites, re-direction outside the envelope of the extraction socket is sometimes necessary. This may be due to the need for better angulation of the implant in order to direct forces down the long axis, or to facilitate a more esthetic restorative outcome. The other reason may be to gain access to bone volume for primary stability (Figure 8). Figure 8:Penetration through lingual wall necessary for implant placement. This re-direction can be difficult since the pilot drill and any succeeding drill will want to naturally follow the path of least resistance. In this case it is the existing extraction socket. By using a surgical carbide bur to create a purchase point through the lamina dura, the pilot will travel in the intended trajectory. The proprietary OCO Biomedical osteotomy formers are deigned to not only follow the path of the pilot, but also create the final diameter for the implant with one drill. This is accomplished by the noncutting, step drill design of the former (Figure 9). 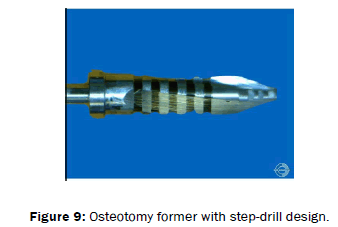 Figure 9:Osteotomy former with step-drill design. As mentioned previously, in immediate placement situations the macro structure of the implant becomes very important, especially the tip. Having an implant that can “grab” bone is important. The tip of the implant (OCO Biomedical) has a patented bull nose auger tip that will increase primary stability by pulling bone in tension around the tip (Figure 10). This action is the opposite of the compressive forces of most tapered implants, yet achieves the same outcome of medullary condensation without the deleterious potential for compression necrosis. In addition, by putting bone in tension, the peri-implant environment is influenced to release TGF-β to increase osteoblastic activity and decrease osteoclast presence . We now have not only a very high mechanical stability (Figure 11), but also an active, rather than a passive implant . 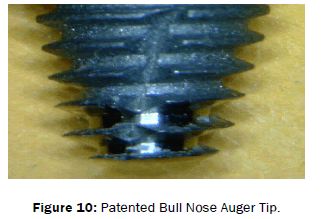 Figure 10:Patented Bull Nose Auger Tip. Figure 11:ISQ reading and smart peg at time of extraction and placement. A device such as an Osstell IDx can quantitatively determine whether the implant is stable enough to load/restore immediately. Using magnetic resonance frequency technology, it will show how much potential sliding movement may occur between the implant and the surrounding bone . If the value, or ISQ (Implant Stability Quotient) is equal to or greater than 70, then the determination to load is carried out. Below this ISQ, the implant will have a cover screw placed and a 3-4 month healing is predicted. By taking periodic measurements throughout the healing process, the loading point will occur when the ISQ climbs to the appropriate level without consideration for elapsed healing time. When considering immediate loading protocols, the use of an ISQ meter is an invaluable tool. Pimary stability and ultimately the success of implants placed in fresh extraction sites is highly dependent on several factors including bone density and quality, implant shape, design and surface characteristics and surgical technique. Implant placement at the time of extraction can be predictable clinically, and shorten treatment times significantly. The patient does not have to go through a second surgical treatment and in many cases can transition directly into a temporary restoration. This kind of treatment can become a significant practice builder and result in both professional and patient satisfaction. Javed F and Romano G, The role of primary stability for successful loading of dental implants. A literature review. Journal of dentistry react-text. 2010;56:38(8):612-620. Testori T, et al. Immediate Loading: A New Era in Oral Implantology Quintessence. 2010. Nasatzky E, et al. The role of surface roughness in promoting osteointegration. Refuat Hapeh Vehashinayim (1993). 2003;20(3):8-19. Mendonça G, et al. Advancing dental implant surface technology from micron to nanotopography, Biomaterials. 2008;29(28):3822–3835. Fischer K and Stenberg T. Prospective 10-year cohort study based on a randomized controlled trial (RCT) on implant-supported full-arch maxillary prostheses. Part 1: sandblasted and acid-etched implants and mucosal tissue, Clinical Implant Dentistry and Related Research. 2012;14(6):808–815. Abraham CM. A brief historical perspective on dental implants, their surface coatings and treatments. The Open Dentistry Journal, 2014;8(1):50–55. O’Sullivan D, et al. Inﬂuence of implant taper on the primary and secondary stability of osseointegrated titanium implants. Clinical Oral Implant Research. 2004;15:474–480. Schlesinger C. Immediately Loading Dental Implants: Doing it right for long term success. Dentistry Today. 2016;84-89. Barikani H, et al. The Effect of Implant Length and Diameter on the Primary Stability in Different Bone Types J Dent (Tehran). 2013;10(5):449–455. Mijiritsky E, et al. Immediate provisionalization of single-tooth implants in fresh-extraction sites at the maxillary esthetic zone: up to 6 years of follow-up. Implant Dentistry. 2009;18:326–333. Degidi M, et al. Five-year outcome of 111 immediate nonfunctional single restorations. Journal of Oral Implantology. 2006;32:277–285. Chu SJ, et al. The dual-zone therapeutic concept of managing immediate implant placement and provisional restoration in anterior extraction sockets. Compend Contin Educ Dent. 2012;33(7):524-534. Bilhan H, et al. Immediate loading: three cases with up to 38 months of clinical follow-up. Journal of Oral Implantology. 2009;35:75–81. Kobayashi Y et al. Force-Induced Osteoclast Apoptosis In Vivo Is Accompanied by Elevation in Transforming Growth Factor and Osteoprotegerin Expression. Journal of Bone and Mineral Research. 2000;15:10. Schlesinger C. Extraction with immediate placement and immediate temporization: the ultimate in patient satisfaction. Implant Practice US. 8(6):20-24. Schlesinger C. Torque Vs RFA in Implant Placement. Implant Practice US. 2016.